Pam Kelly left with Leslie Nicole Smith and her service dog, Isaac. Pam Kelly and her dog, Sandy, were inseparable. The onetime Army sergeant and her Labrador-beagle mix spent 14 years together. Sandy died a few years ago, and Kelly still carries the dog’s leash tied to the footrest of her wheelchair. “It’s a reminder that Sandy will always be a part of me; I can’t forget her,” Kelly, 51, said. Now, she is looking for a new dog to improve her life in a way far beyond what Sandy could do. Sgt. Pam Kelly served as a medic in the Army 17 years until she was injured in a training accident that crushed her spine, and severely injured her head and shoulders. She is a quadriplegic and has some mobility in her left arm. Kelly has been searching for a multi-task service dog for years. The cost is expected to be around $10,000 and on Friday night at a packed SeaBreeze Recreation Center, more than 220 Villagers turned out to help. The event was called “Paws for a Hero” and featured karaoke singers, dancing and special fund-raising events. A total of $4,086 was raised. John “Jaybird” Corcoran left with Rob “Elvis” Bogdonoff and Marie Bogdonoff. Marie Bogdonoff heads the group Villagers for Veterans and helped organize the event. Kelly knows a service dog will help her emotionally as well as physically. Leslie Nicole Smith understands those feelings. She is legally blind and lost her left leg as a result of military service in Bosnia. She has a service dog named Isaac, who has been with her for about six years. “He reinforces an attitude that you’re not alone and he will always be there,” Smith added. “He’s like a teammate; when you have a rough day, he helps you get through it. When I look at his big ears, his eyes and I pet him, I feel everything will be OK. The biggest challenge may be bonding with the dog. Kelly has been searching and there is a long waiting list for such service dogs, she said. Smith said she found Isaac and it only took about a week for her and the dog to bond. “It was just a natural thing,” she said. 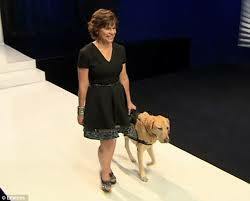 Smith added that she feels “protected” by the dog, when she’s out shopping, or in unfamiliar public places. “He makes me feel safe,” she said. “Paws for a Hero” turned into an entertaining night with local karaoke singers taking turns on stage. “Seeing all these people here is fabulous and each and everyone of us is saying thank-you to Pam,” said John “Jaybird” Corcoran, who with his wife, Trish, supplied the backing music. 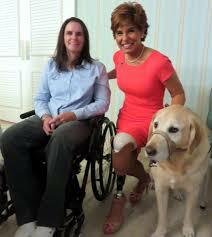 The Corcorans son, Pat, was severely wounded while serving in Afghanistan and is confined to a wheelchair. “We understand the sacrifice and how hard it is; and that’s why we’re here for Pam,” Trish said. Doreen Buresh lives in The Villages and performed “Tears In Heaven” on the SeaBreeze stage. “When you see veterans getting injured, it just tears your heart out,” she said. Willie Lake, another Villager, belted out, “That Old Time Rock and Roll” on stage. Rob Bogdonoff, Marie’s husband, was a sight to behold dressed in an Elvis jumpsuit with sunglasses to boot. When Project Runway All Stars' four remaining designers were tasked with dressing four female military veterans from the Army, Marines, Air Force, and Navy, they rose to the challenge. And so did the models. Leslie Nicole Smith, a U.S. Army veteran amputee with a prosthetic leg, walked the catwalk proudly in dress designer Joshua McKinley had made for her to wear to a military ball. Proud of her service and her survival story, Ms Smith showed off her legs in five-inch heels and a short-sleeved little black dress, the hem of which grazed the top of her knees. The designers were asked to make special occasion dresses for the veterans, including a wedding, a military ball, a bachelorette party in Las Vegas, and a fortieth birthday party, where they would then judged by Carmen Marc Valvo and Katie Holmes. Previously, in similar Project Runway challenges, the designers have complained about having to design for 'real women,' but the four guests appeared to receive ample care and attention. And Leslie's designer, Mr McKinley, seemed particularly inspired because his brother is a soldier in Afghanistan. 'Meeting with Leslie definitely hits close to home with me,' he said. The the pair first met, Leslie revealed how she lost her leg 'two weeks before the end of my first deployment,' she said. 'I developed a blood clot in my leg, I was taken to the army hospital on imminent death status, with 24-hours to live. 'When they amputated below the knee, the first thought I had was "am I going to be able to wear high heels?"' she admitted through tears. Mr McKinley bought a bold leopard print fabric at Leslie's request, but used it with elegant restraint, dying it a muted green and using it sparingly as trim. He also made a matching outfit for her service dog. After Leslie had walked the runway smiling, designer judge Carmen Marc Valvo ask her if she actually wanted to wear an outfit to her military ball which revealed so much of her prosthetic leg. 'Absolutely,' she responded.